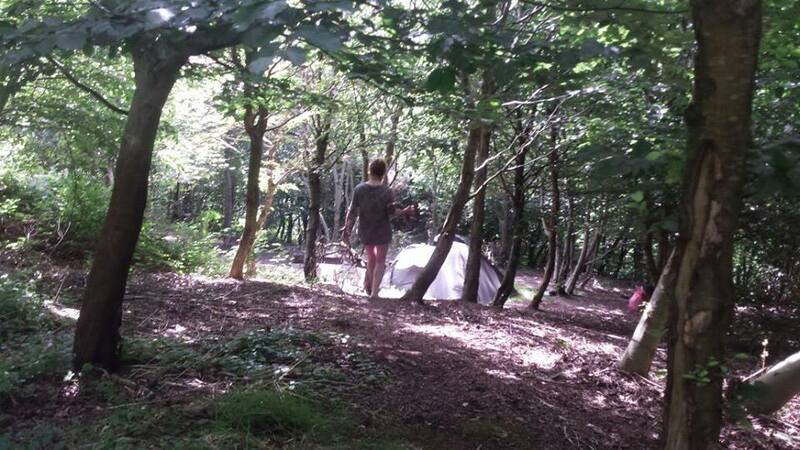 Wild campsite in private woodland by coast - cyclists and walkers only, compost loo and stream shower, covered cooking area for open fire camp cooking, peace and quiet with just the wildlife for company! 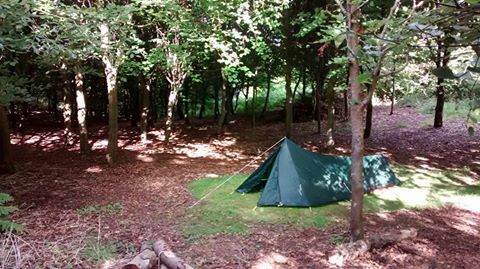 Yomer Wood offers old fashioned wild camping amongst nature. The woods are only accessible by foot or on bike and you can pitch anywhere and expect only the wildlife for company. Facilities are minimal - a comfortable compost loo and a sink and drainer for pot washing fed by rainwater. Bottled drinking water is supplied. There is a sort of shower in the stream for a bracing wash, or you can take a dip in the pond. Alternatively, you can boil up some water on the open fire and have a strip wash (you will probably be alone!) A covered cooking area around an open firepit is provided and you are welcome to gather brashings and fallen wood to feed the fire. Dont forget your torch! We can be found in a little village called Lee, on the North Devon coastal path between Woolacombe and Ilfracombe, and in a valley leading down to Lee Bay. Access by bike is easy - a few minutes from Route 27 Devon Coast to Coast near Ilfracombe - you can cycle into the woods via the neighbouring farm/holiday centre and stop by for a few groceries or tea and cake in their farm shop if you time it right. You can sleep with your bike or lock it in the workshop at the top of the site if you prefer. If you wander into the village after pitching, you will find a lively pub, The Grampus, and a great bay for a refreshing swim. Rates: are £7.50 per adult per night and £4.00 for under 15's. Children and pets are subject to negotiation due to safety concerns. The whole site is available to book exclusively for £75.00 per night to parties of up to 10 adults - please send us a message if you're interested!